The Common Pre-Tests are age-standardised tests used to assess students’ attainment and potential when they are in Year 6 or Year 7, prior to entry to some (not all) independent (private) senior schools. The test provides a universal and standardised measure of attainment, ability and potential. There are a number of pre-tests but the most popular one is the ISEB Common Pre-Test. It is created for the Independent Schools Examination Board (ISEB) by GL assessment. The ISEB Common Pre-Test is adaptive which means the difficulty of the next question depends on whether the current question is answered correctly or not. If the current question is answered correctly, the next question will be slightly more difficult. Similarly, if the current question is answered incorrectly, the next question will be slightly easier. It is important to check if the school that your son/daughter is applying to requires the ISEB Common Pre-Test to be taken. A list updated to January 2019 is here. Why Do Candidates Need To Take The ISEB Common Pre-tests? A number of schools require candidates to sit the ISEB Common Pre-Test for two main reasons. First, it is a way for senior schools to assess a candidate’s academic potential 2-3 years before starting. Second, highly selective and over-subscribed senior independent schools use the ISEB Common Pre-Test to deselect candidates that do not meet their required academic level. In this way, it is helpful to view the ISEB Common Pre-Test as a ‘qualifying’ exam where candidates who pass this stage will be invited to proceed to the next stage of the school’s admissions process. The Pre-Tests are taken online, usually in the candidate’s current school, and consist of multiple-choice tests in mathematics, English, verbal and non-verbal reasoning. Once a child has been registered for a senior school, the senior school will inform parents if candidates are required to sit the ISEB Common Pre-tests. Parents do not need to register their children for the Common Pre-Tests. For children who are applying to more than one school that requires the ISEB Common Pre-Test, they will only need to take the test once per academic year. Once the test has been completed, the senior school will receive a notification from ISEB informing them that they can access the test results from ISEB. In the very unlikely event of a candidate taking the tests more than once within a single academic year, the senior school(s) will be informed and the first set of results will stand. The tests can be taken in the candidate’s own school or at the senior school for which he or she is entered. For overseas candidates, the test can in theory be taken in an international test centre but in our experience the easiest and most efficient method is to have the test administered and taken at the candidate’s current school. Obviously, this will have to be done in agreement with the current school. Please contact us if you would like further information about this. Different schools will have different deadlines as to when candidate need to sit the pre-test by. However, for many of the most competitive schools, candidates must complete the pre-test by the last week of November of Year 6. Please consult with senior school to confirm the precise date that the pre-test needs to be taken by. Once the test is completed, the scores will immediately and automatically be sent to the senior schools that the candidate has been registered for. What Is Tested On The ISEB Common Pre-Test? The test comprises of 4 sections. They can be taken in any order. There are a set number of questions for each section which candidates should aim to complete. The test is multiple-choice which means for every question there are five answers a candidate must choose from. Four are incorrect, and one is the correct answer. Each question must be answered and candidates cannot go back to previous questions. While taking the tests, candidates are able to track their progress within the test (number of questions answered in relation to overall number of questions). Candidates use a mouse to select their answer and to click ‘Next’ to proceed to the next question. There is a progress bar at the bottom of the screen that tells candidates how many questions they have answered and a timer at the top of the screen will indicate how much time they have left. Candidates cannot return to a question once an answer has been submitted and the ‘next’ button pressed. Officially, the ISEB website says that “no special preparation is required for the Common Pre-Tests which are designed to identify potential as well as attainment. Practice tests are not available.” However, in our experience, one can, to a degree, prepare for any test and students who have received a structured programme of support have increased their test scores significantly. The ISEB pre-test is no different. There is no doubt that familiarity with the different question types, experience of the computerised interface and knowledge of what to expect can significantly improve a student’s test score. Furthermore, if a candidate is confident and not fazed by the process, they stand a better chance of performing to their maximum potential. Candidates can improve their scores and performance by reviewing and practicing the same question types that appear on all four parts of the test. For overseas candidates who do not currently study in the British education system, it is strongly advised that professional advice and support is taken as the contents of the ISEB pre-test will be nothing like what a candidate will cover in his/her local education system. Also, there is a new familiarisation test which senior schools can share with candidates’ parents. While this will gave a flavour of the test format and style, the familiarisation test contains a limited number of easy practice questions. For information on ISEB Common Pre-test preparation, please contact us. The ISEB pre-test provides a universal and standardised measure of attainment, ability and potential. The Standardised Age Score (SAS) is the most important data point from the test. The SAS is based on the number of questions answered correctly; the score is adjusted for age and placed on a scale which makes a comparison with a standardisation sample taken from the UK independent schools sector; the average is 100. Each candidate’s results will include the time taken for each test element. The average score is 100. Possible scores range from 60 to 140+. The SAS is key to benchmarking and tracking progress and is the fairest way to compare the performance of students within the same year group who have a different age. The pre-test report also gives individual stanine, percentile rank and group rank scores, together with mean SAS. The stanine scores a student on a scale from 1 (lowest) to 9 (highest) and offers a broad overview of performance. 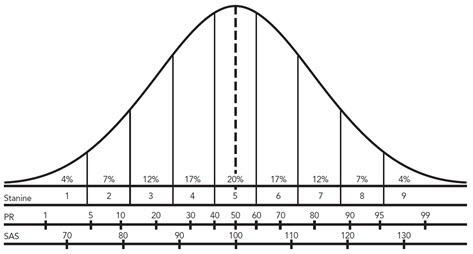 The normal curve of Distribution shows the relationships of stanines, national percentile ranks (PR) and standard age scores (SAS). Percentile rank (PR) and stanine are based on the standardised age score. The only variance is that they use different numeric ranges (see below). Which Schools use the ISEB Common Pre-Tests?